A broken big toe is very painful and typically limits your mobility. Toes are key factors in balance and mobility. As your big toe carries the majority of your weight, the impact of a break is more significant than with other toes. If you think you’ve broken your big toe, seek medical attention right away. The toe needs to be set correctly so that it can heal properly. Though any break is painful, a broken big toe needs immediate attention due to its importance in your mobility. Rest your foot and avoid putting any weight on the toe. Ice the area to reduce swelling, inflammation, and pain. One response to a minor toe break is to create a “buddy toe” — immobilizing the toe by taping it to the adjoining toe. If the fracture is more severe, your healthcare provider will likely prescribe a cast or a hard-bottomed boot. Both of these options help the bone heal correctly by limiting any possible movement. Broken bones will usually recover in close to six weeks, though recovery times vary. Follow your provider’s advice to be sure that your broken big toe heals as quickly as possible. If your toe bone is severely broken or shattered, surgery may be required. Pins, screws, or plates may be inserted to force the toe to heal correctly. You may consider visiting an emergency room for your broken big toe. However, there are other less expensive and faster treatment options. 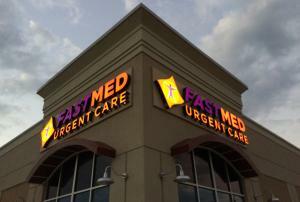 At FastMed Urgent Care, no appointments are required, and our goal is to have you seen within an hour. FastMed offices are equipped to deal with injuries that need immediate care, like a broken big toe. Our medical professionals will take an X-ray of your toe and decide the necessary course of action. Check out our FAQ page for all of your medical questions. Don’t just take our word for it. Find out why our patients are happy with their care at FastMed!